Hit the slopes whenever you want with family or friends. 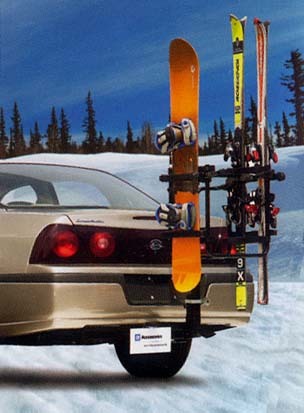 The GM Accessories hitch-mounted ski carriers attaches to the hitch-mounted bicycle carrier and is outfitted to carry up to six pairs of skis or up to four snowboards. With the hand-operated lever tilt-down feature, you can open the cargo to reach ski boots, gloves, and extra parkas. Featuring adjustable locking arms, the carrier can accommodate skis of different sizes.